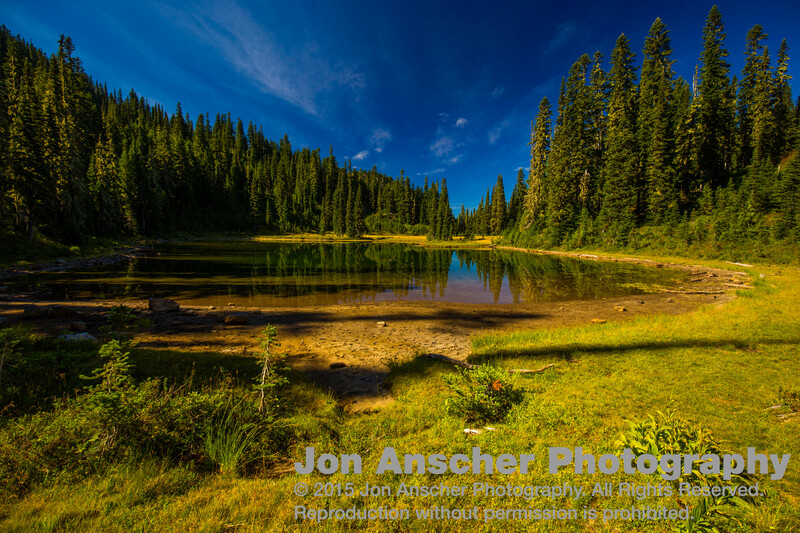 On this hot summer weekend, we decided to head out for a relaxing trip in the Chinook Pass / Bumping Lake area. 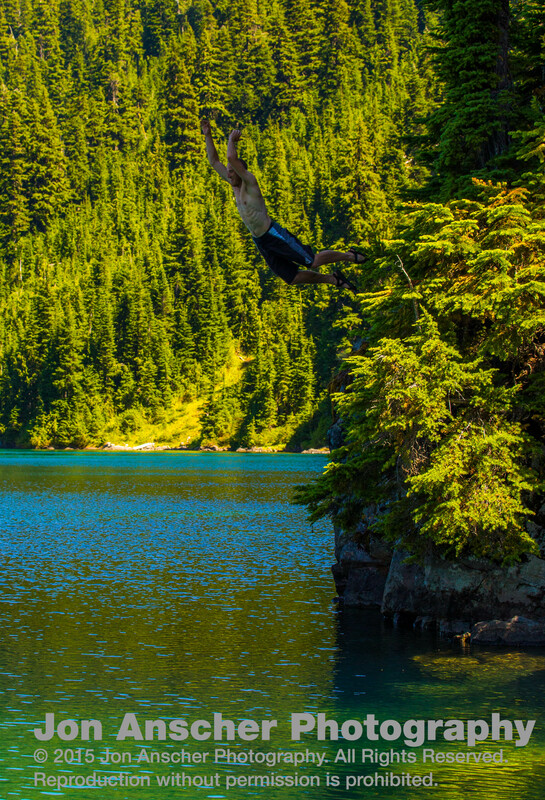 Leaving late on a Friday, we decided to take it easy, camping at Dewey Lake on Friday night, American Lake on Saturday, and taking a short day hike out to Cougar Lakes, being sure to take a dip in each of these beautiful sub-alpine gems. Leaving at about noon, we still couldn’t seem to avoid the interminable Seattle traffic. But, with a stop to grab lunch on the way, we still made it by 2:30. 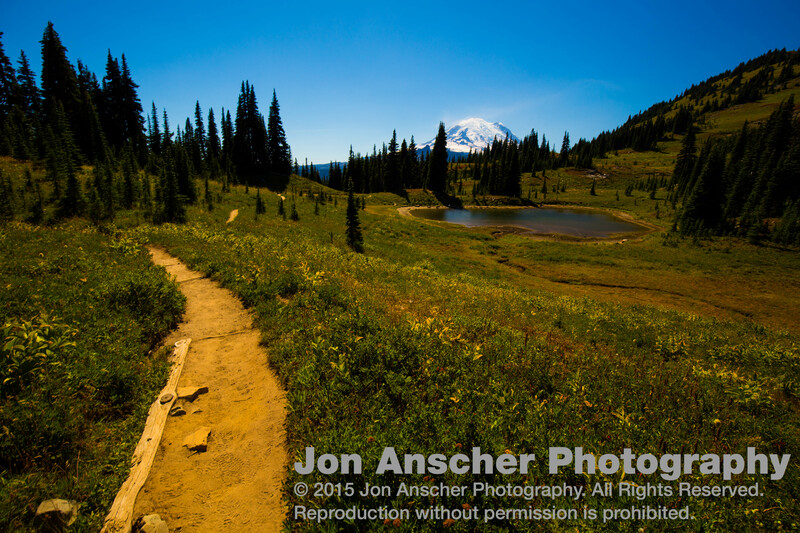 We started from Tipsoo Lake, hiking counter clockwise on the Naches Peak Loop. The day was definitely hot, and this part of the hike had little in the way of shade. 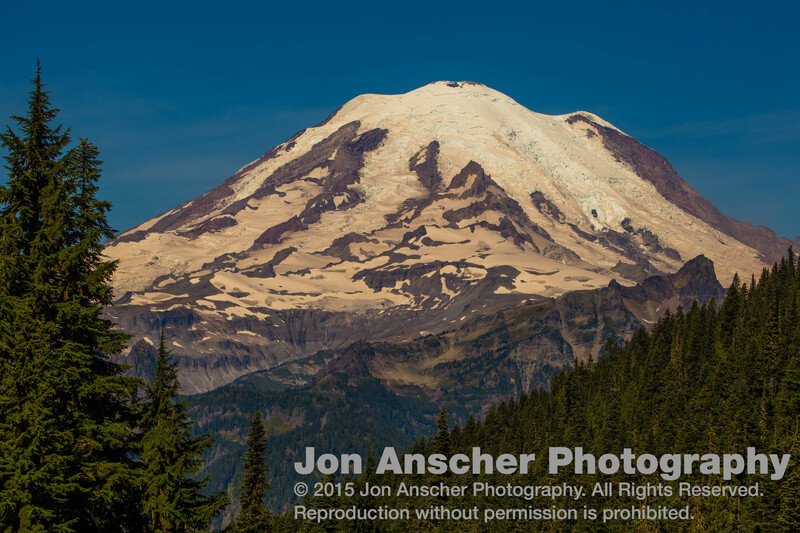 As we angled around, we got the quintessential views of Rainier from atop this easily accessible pass. 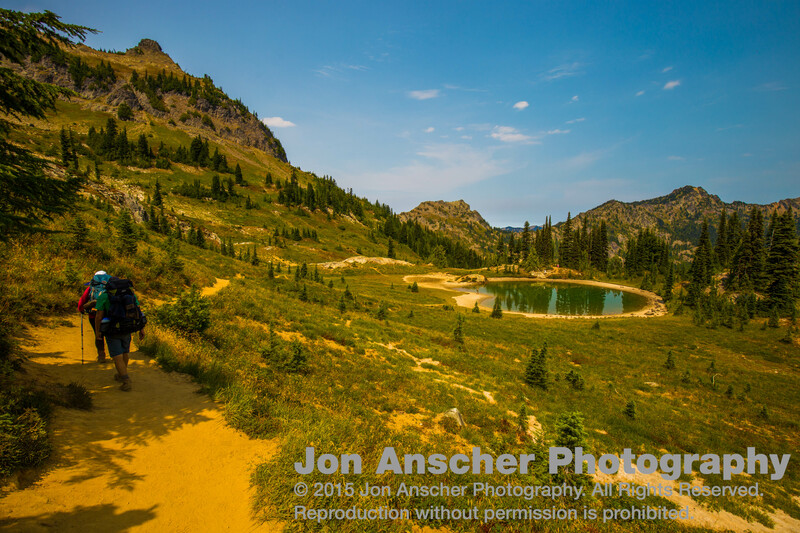 If you have not been here before, the 3-mile Naches Peak loop is an easy hike with spectacular views of the surrounding country. In the distance we could just make out Mount Adams. Coming around to the high point of our day, we took a moment to enjoy the beautiful view before the descent into Dewey, and to blessed shade. It is not long before the exposed alpine slopes give way to sub-alpine trees. Dewey, sitting at 5100 feet, has a nice balance of sprawling meadows and forested camps. And this huge lake offers plenty of space for all (unlike it’s much tighter cousin, Sheep Lake, 2 miles northeast of Chinook Pass). This is a perfect early backpack trip for kids. There are plenty of sites around the lake, some of which are not oft visited. Knowing that we were headed on down the PCT tomorrow, we wisely decided to continue around to the far side of the lake. Aside from saving us from what must have been a quite loud group (we heard them clear across the half mile long lake), but we also saved some distance for our hike the next day. 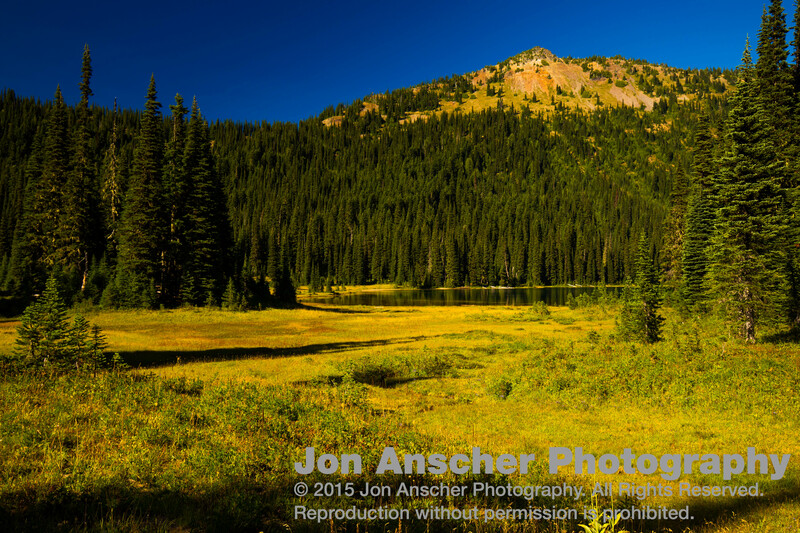 As we traveled through the grassy meadows, we realized there was much to explore at this alpine lake. Side trails jutted off in many directions would make for an interesting time exploring with young campers. As we neared the far side of the lake, we began looking for a site in earnest. Careful to remain 100 feet away from the lake, we found a nice spot tucked into the trees and overlooking the lake below. A nice log provided a good place to sit and a small trail provided ideal access to the shore. A nice log lay at the bottom of that trail along with a sandy beach to the left and a nice rock outcropping to the right. We enjoyed a nice long swim in the cool, clear waters, and were happy to have a slow and relaxing evening. Without a need to rush, we enjoyed a lazy morning making breakfast and packing up. Being a photographer, I’m generally up early regardless, so I went off to take some early morning photos around the lake. Moving east along the south shore, I quickly saw a part of Dewey I’d never seen before: Mount Rainier rising above the waters in the distance. Always having stuck to the west side of the lake, I’d never see Rainier from down in this valley. But the morning light made for some amazing photography as I explored more of the shore. In a mere hour or so, and 2 miles out, we reached the tiny Anderson Lake. This lake was clearly suffering from the warm winter, the water level well below normal. There is no camping right at the lake, but rather some sites are available a few hundred yards away. These sites looked nice and do have better tree coverage than American, but regardless, we decided to move on. Another mile brought us up the final climb of the day and into some beautiful open meadows with views of Rainier to the west and Bumping Valley to the east. As we hiked back down from the meadows, we came to the junction where we would leave the PCT, right at the saddle between two small peaks. To the right, the PCT continued south to the many lakes between here and White Pass. But, we headed left another half mile to American Lake. As soon as we got there, Amy and Tommy were glad we ha chosen not to stop at Anderson. 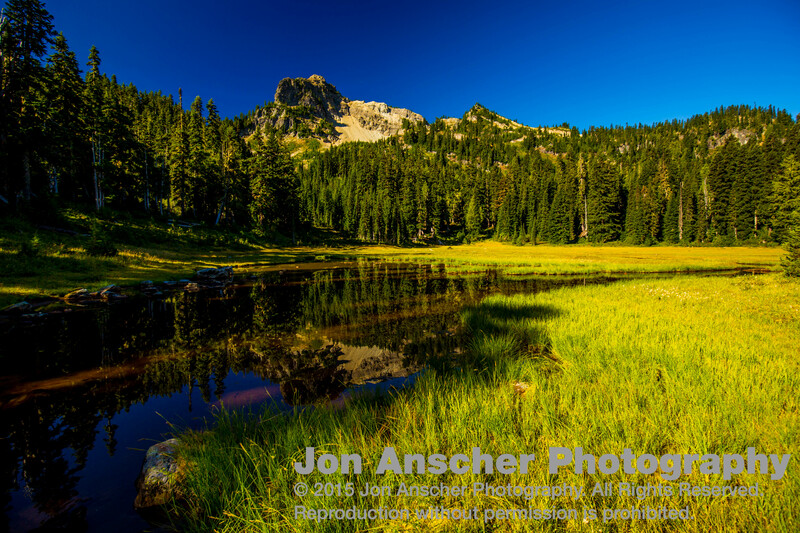 American Lake is tucked in a small bowl with beautiful views to the basalt and granite spires above and the valley below. Our first order of business was to search for a camp that would avoid the scorching hot rays of the sun. This task was harder to do than expected, but we found a nice spot that balanced some sun and some shade. Once we had setup camp and had a chance to eat, it was time again for a refreshing swim. It did not take long to find an ideal rocky outcropping from which to enjoy the cool waters. Here we saw for nearly an hour, finding escape from the afternoon heat. After a long swim and some time to dry off, Tommy and I decided to begin our trek out to Cougar Lakes while Amy setup her hammock and enjoyed a nice nap. The way to Cougar is surprisingly further than it seems. While a mere 2 mile hike, it does a fair bit of climbing and the trail itself has been worn down by heavy horse use, especially after the intersection from Swamp Lake and the American Ridge Trail. Thinking it would be an easy trip, we decided to travel with our camp shoes (a pair of crocs and some Chacos with the soles starting to delaminate). We regretted that choice as the long dusty hike too it’s toll. But, the reward was worth the suffering when we finally came to the smaller of the two mountain lakes. To say smaller is a bit deceptive. Little Cougar is perhaps a third the size of Dewey and much larger than any of the other lakes we saw on this trip. Big Cougar is then four times the size of little Cougar, sprawling a mile and a half across this high altitude plateau. A land bar separates the two with several good looking camp spots. 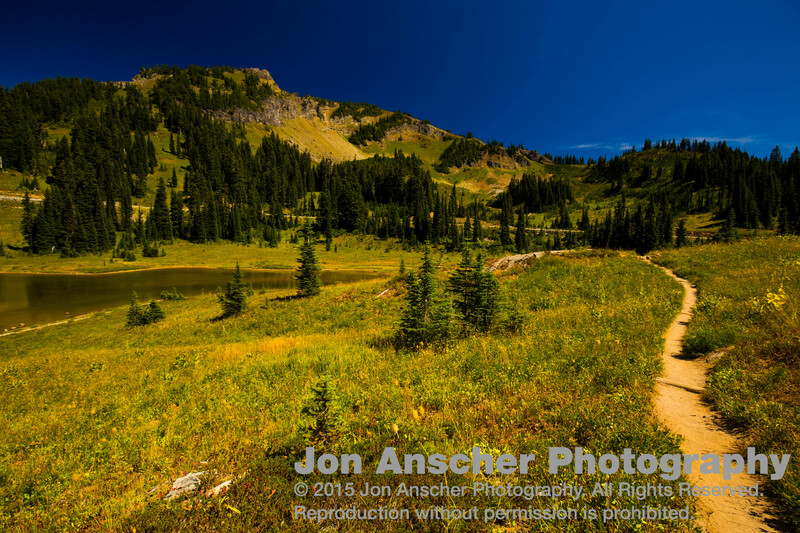 The trail continues around to the south side of Big Cougar which opened up into a pleasant meadow. Several campers had found their home there for the weekend. This huge lake stretched far to the North, and we were awed at the crystal clear waters. The inlet was surprisingly chill, fed by the cool mountain run off. And the beach was smooth and sandy and stretched the entire way around the south shore. Making our way around the south shore, we found a small rock outcropping from which to launch our swimming. After a bit of exploring, we discovered a good jumping rock 10–12 feet above the lake. From there, we jumped into the clear water below. Colder than the other two lakes, we did not stay here quite as long, but enough to wash off the dust and grime from the hike here. Knowing we had to make the hike back, and wanting time to take one last dip back in American Lake, we decided not to dally too long. Making our way back around the way we came, we said goodbye to this breathtaking bodies of water. Making it back by 4, we discovered we had been joined by several other campers. 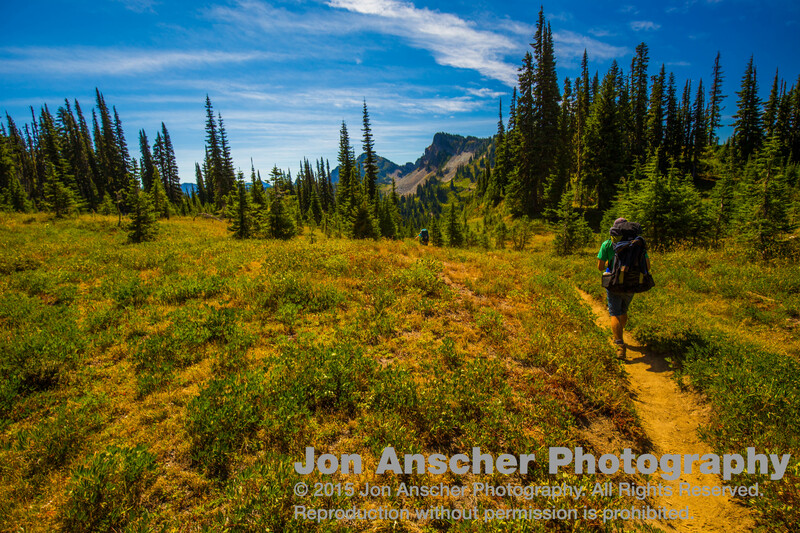 We were sad to see several of the groups paid no attention to backcountry etiquette and leave no trace, camping directly next to the lake on fragile subalpine grasses (rather than 100 feet away and on pre-established sites as leave no trace dictates). I see this all too often, whether through ignorance or arrogance, campers take over a place, with no regard to the fragile ecosystem they are impacting. At least no one was camping on the designated restoration or day use only zones. After one final swim, we headed back to our site for dinner. With a beautiful sunset, we decided to take our dinners back to the outcropping and enjoy a little of the evening light. 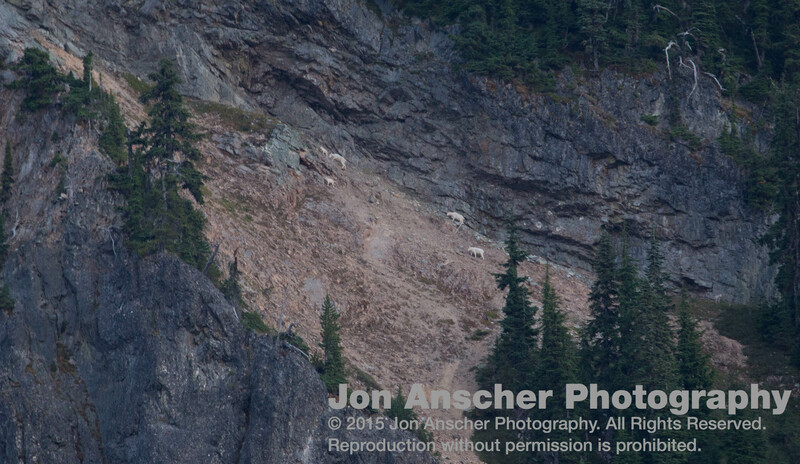 As we sat, we spotted a herd of goats high up on a rocky face above. Too far for any good shots, the best I could do was capture a few photos to document the sighting. We were both impressed and on the edges of our seats watching these nimble creatures jump across the steep rocky cliffs. After the goats had all gone, we returned once again to camp for a few games of speed scrabble and cards before night set in and we shuffled off to sleep. Wanting to get as much hiking done before the afternoon heat, we made for an early start on our way out. Leaving camp a bit before 8:00, we found ourselves back and Dewey by 10:00. Taking a brief moment to pump water and enjoy Dewey one last time, we continued our hike back up to the Naches Peak Loop Trail. Rather than returning the way we came, we continued along the rest of the loop, hitting the second unnamed alpine pond our way. With the sun at it’s hottest, we did not stay long, but continued along our way home. Getting back to the car a little after 1:00, we gratefully changed clothes and slipped into the refreshingly air conditioned car for the ride back home.